Following the opening of the Harrods concession in July, Neill describes his first fabulously creative project with Harrods' editorial team. 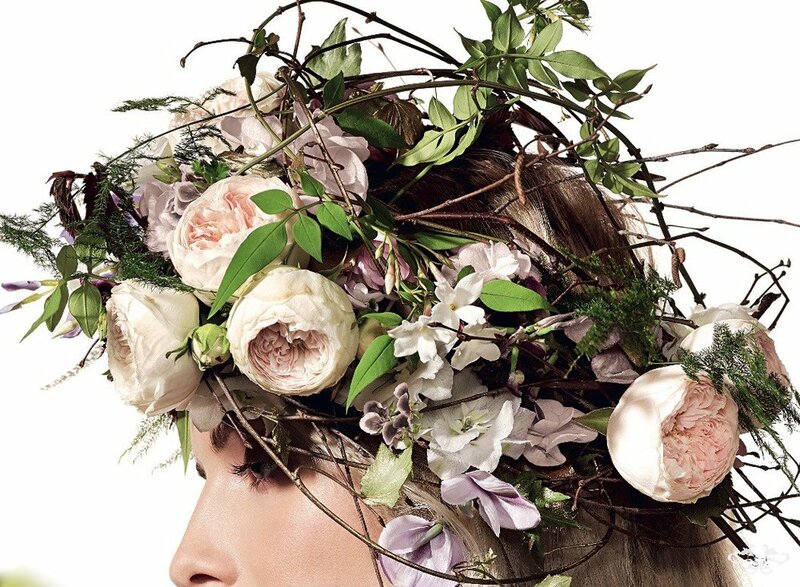 A series of floral crowns inspired by the mood and ingredients of the iconic department store's new fragrances, all depicted in the August edition of Harrods magazine, including the cover. While we were preparing for the opening of our concession back in early July, we had our first inspirational project with Harrods, working with their editorial team on a nine-page spread in the August issue of Harrods Magazine, featuring new fragrances from the top perfume-makers of the world. 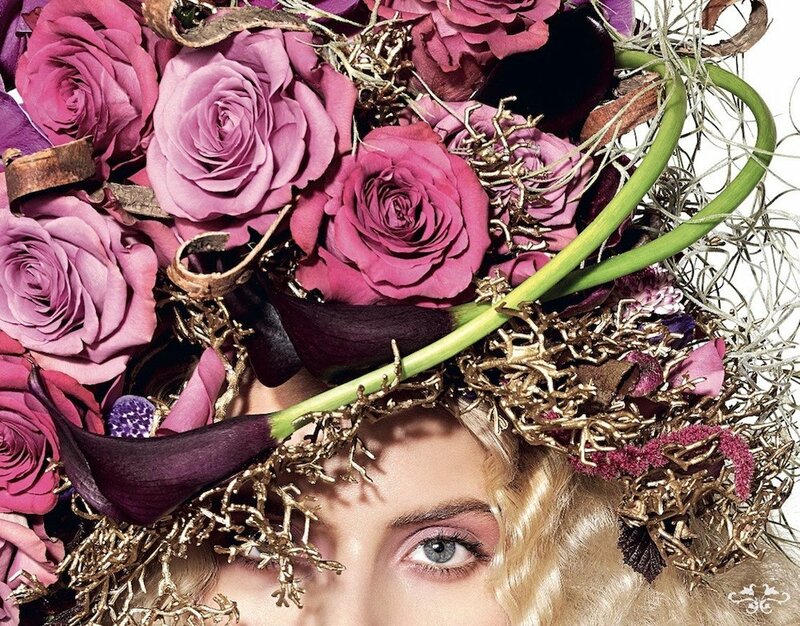 We were asked to create floral crowns, headdresses and fascinators for nine extraordinary fragrances as well as the front cover of the magazine, and for each one we were given distinctive briefings including the mood and the ingredients of the fragrance, many of which were floral. For the first page of the article (above) we had artistic freedom to set the tone for the following pages. I love working with garden Roses and Orchids so we created this headdress with scented garden Roses, new varieties from our amazing Dutch grower, together with Cymbidium and Phalaenopsis Orchids while trails of greenery and Amaranthus added texture and depth to the design. For Alexander McQueen's EAU BLANCHE the briefing requested white florals and white feathers. The fragrance features Jasmine Sambac, Tuberose and Ylang-Ylang with crisp Violet leaves and clean white musk. Our floral interpretation included open blooms and buds of Tuberose, white garden Roses, long sinuous leaves of Tillandsia in soft grey along with the feathers and white-sprayed fern to add contrasting textures. The gentle downward movement of the design creates a feeling of glistening, moving water, Eau Blanche. Our briefing for Burberry's MY BURBERRY BLUSH was "Boho bridal, light, airy, soft and youthful" corresponding to its playful take on the classic Burberry perfume. This fragrance is inspired by a London garden in the first light of day with floral and fruity accords including Rose, Jasmin and apple. Hence, our design is in the style of a summer garden with wild trails of Jasmine and gorgeous garden Roses along with delicate white Delphinium and violet Cyclamen flowers and fern. 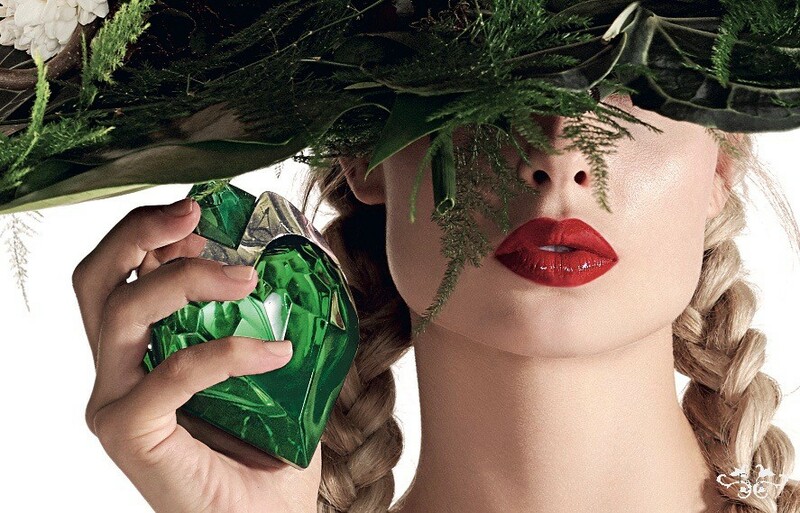 The model takes a bite of a green apple to give a hint of the apple tones of the fragrance. Another water inspired fragrance, L'OMBRE DANS L'EAU by Diptyque inspired us to create a swimming cap style design made from Hydrangea and blue Delphiniums intermittent with Blackcurrant berries and leaves (one of the dominant scents of this fragrance along with Bulgarian Rose) and green "baubles" of Chrysanthemum. The velvety texture and style of this cap evoke the rich musk scent of the fragrance. This fabulous floral headdress was created for NEBULOUS by Boadicea the Victorious. The fragrance is moody and mysterious with the unexpected combination of sweet Rose and Violet with spicy saffron and rich oud. So I chose a sultry, sensual colour palette of violet and dark pink, Roses interlaced with gold-sprayed roots, trails of Tillandsia and long sweeping stems of aubergine-coloured Calla Lilies. The curving lines of bark signify the bark of the tropical Agar tree from which oud is derived. I wanted to create a dramatic effect in harmony with Boadicea's magnificent bottle and of course the exquisitely exotic fragrance. More divine oud wood and Rose scents in Guerlain's rich Oriental composition OUD ESSENTIEL inspired this majestic crown created primarily with Birch bark - again reminiscent of the Agar tree bark where oud is sourced - topped with Cymbidium and Vanda Orchids, trails of Amaranthus and touches of moss for texture and twigs for movement. Elegant and intriguing, as is Thierry Wasser's magnificent fragrance. Byredo FLOWERHEAD is Indian-inspired and our briefing was an Indian-focused headdress with floral garland (leis) to hang around the model's neck. The Lingonberry, wild Jasmine, Tuberose and Rose scent of this fragrance inspired me to create a bold floral headdress in the exotic rich colours of India: yellow, orange and pink. Amber-coloured Rose petals are strung together to make the base of the headdress with tumbling trails of Tuberose buds, Dianthus and Chrysanthemum as well as a necklace of spray Chrysanthemums to accentuate the floral flavours of this fragrance and the important role of flowers in Indian wedding ceremonies. The next design is a traditional-shaped floral crown for Clive Christian's NOBLE VIII MAGNOLIA and NOBLE VIII IMMORTELLE inspired by the intricate bottle-stopper of these two fragrances. The base of the crown was constructed with Birch twigs, carefully crafted into the shape of a traditional royal crown and adorned with Roses, Crespedia and Magnolia buds with a ring of moss around the bottom and cropped grass on the top. The briefing for Mugler's AURA was "a structural hat, botanical, leafy and jungly." 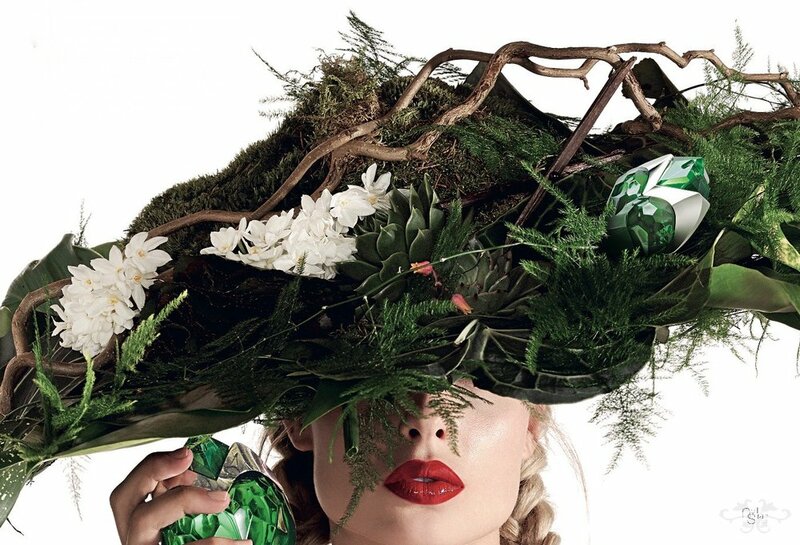 So, for this rich and fantastically fresh fragrance, we created an imposing vertical hat of many leafy tropical foliages and twigs to represent the wolfwood ingredient, embellished with Orchids resembling orange blossom flowers (the dominant scent in this fragrance), Vanilla pods (another dominant scent), Succulents and fern to evoke the exquisite green glass bottle, all in a striking, contemporary style. The final page of this fabulous spread of fragrances was dedicated to Robert Piguet's V DE ROBERT PIGUET. This fragrance is described as a celebration of exotic travel and exploration, contrived with exotic ingredients sourced from all over the globe such as Ylang-Ylang, pear, bergamot, cinnamon, Rose, sandalwood and vanilla. 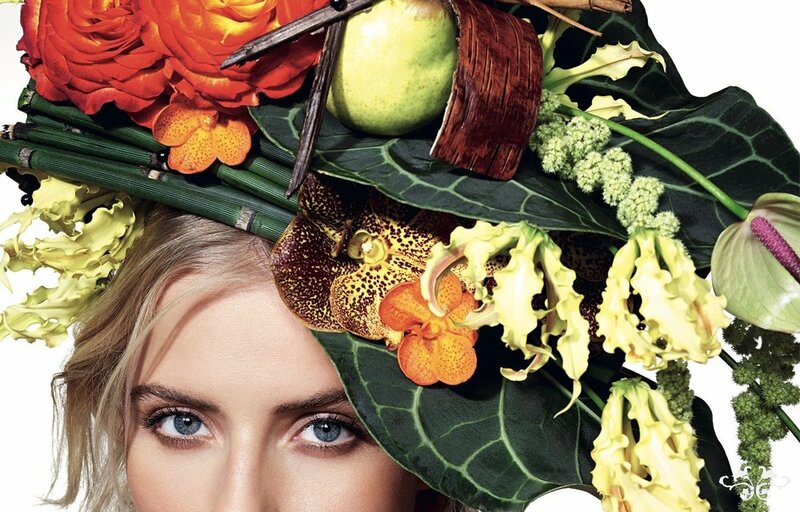 We created a glamorous hat with plant material inspired by the ingredients of the fragrance. Tropical leaves and Snake grass, Roses and pear, Vanda Orchids (bearing in mind that vanilla comes from Orchids), Vanilla pods, bark varnished to resemble leather, tropical Anthuriums (also leathery), trails of Amaranthus and the exotic Gloriosa flowers that have an uncanny resemblance to Ylang-Ylang flowers. A necklace of Snake grass and Vanda Orchids completes the picture of alluring colours and enticing textures. One of my own passions is for fragrance. I like to alter my colognes according to my mood and activities, even layering them sometimes for a more intriguing effect. Each of these Harrods fragrances is exceptional and this highly creative styling project has been inspirational. It was amazing to work with Jan Masters, the editor of Harrods Magazine, whose creativity and guidance helped us to produce such fabulous results. May there be many more collaborations! I hope you have enjoyed the images as much as we did creating them, and if you are sufficiently inspired, pop into Harrods and smell the fragrances for yourself.